When I first heard that Jurassic World would be set in an actual, functioning dinosaur theme park, it was as if a light went on in my brain. I never realized just how much I wanted to see that movie until someone actually said it out loud, and I instantly felt stupid for never having thought of it earlier. 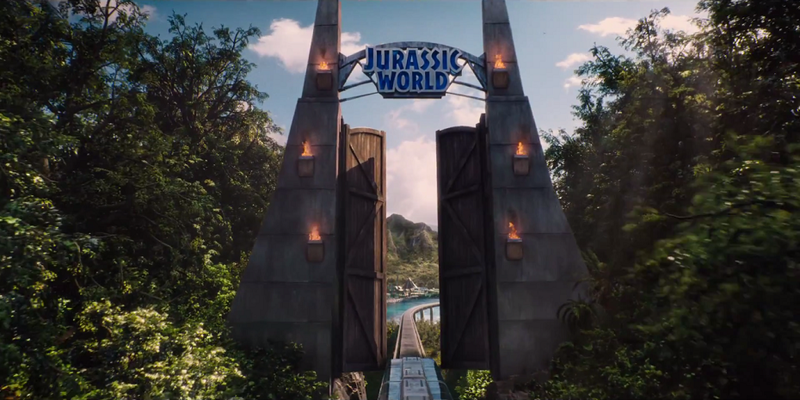 Now we've got our first real look at Colin Trevorrow's version of Isla Nublar in the first trailer for the movie, which I thought was supposed to premiere during Thanksgiving football. I'm happy to get it two days early, as now I can spend Thursday focused on my 12 pound ham. I really love the world building here. The lazy river, the water show, those crazy bubble cars...I am all about it. I remain a little skeptical about that kid from i, but I dig that Bryce Dallas Howard is actually running around the park, striking Goldblum-esque poses with road flares. I'll reserve judgement on the actual dinos, as we're way too far out for any of the effects work to be completely finished. I do really, REALLY love that haunting arrangement of John Williams' original score. Astoundingly enough, what I'm most concerned about right now is Chris Pratt. Dude is trying real hard to put on his Serious Face for this movie, which is the opposite of what I was expecting. Not that I thought this was necessarily gonna be Star Lord Plays With Dinosaurs, but he just looks so stiff and uncomfortable. Pratt delivers his lines here with all the charm of a doorknob, something I never thought I'd hear myself saying. Maybe he's playing some kind of total burnout, which could be totally great, but the way his scenes are cut together here, largely with no one to bounce off of, feels a bit clunky. Then again, we've got that amazing shot of him riding a motorcycle alongside a pack of trained velociraptors. The only way that could get any better is if Pratt was riding an actual dinosaur that had lasers strapped to its head. I can still dream.